What I'm currently using is a Dell D810, and my ' Compaq retroserver' doubles as a server as well as HTPC and SqueezeBox client. I've been modding an old Paradigit Enforcer PC which is used by wife and kids as a combination of game, work, and video machine. 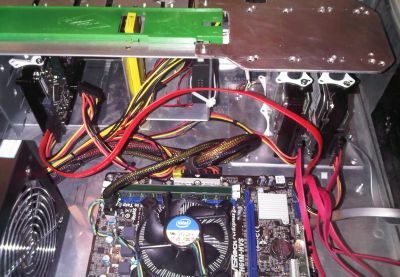 It's a Core 2 Duo machine, using a Fujitsu Siemens mainboard, and I had some serious 'fun' trying to get a decent video card to work... As it turned out, ATI's 5xxx series would not work in PCI Express v1.0 motherboards (or at least not in this one). Very annoying. A 9600 GT 'green' and a GT 420 worked fine. (There are many stories about NVidia cards failing on some boards, however my personal experience over the years has been quite the opposite!) Some notes on power here, some notes on performance here. Still, it works, and works well. The only exception was standby mode under Windows XP. Whenever I send this machine into standby mode the CPU fan starts spinning up full speed which is rather annoying. I increased the shut down time a bit and set it to hibernate. I considered using this one as a home server but decided against it... It doesn't do standby properly, consumes more power when idling, and I need an additional video card to output HDMI (I plan to use my homeserver as a regular HTPC as well as a server.) Still, if you got hardware like this laying around, then you wouldn't have to buy new stuff, and that would easily negate the addional power consumed when comparing with more recent hardware. It's worth a thought! 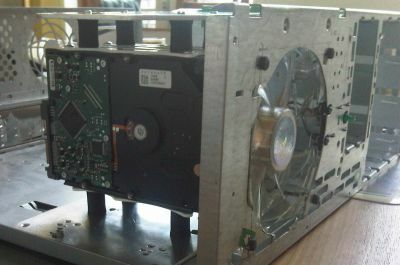 This machine is a mini-tower so the drive is mounted on its side when in use, not upside down as the image above would suggest. As a result, the machine now wakes up from standby when pressing a (USB) keyboard key and wakes up from hibernation using the power button. That's fine. Booting from an USB stick is tricky as well. I left out any FDD / CD / DVD. I used a temporary drive to install XP, but disconnected it after completing the installation. 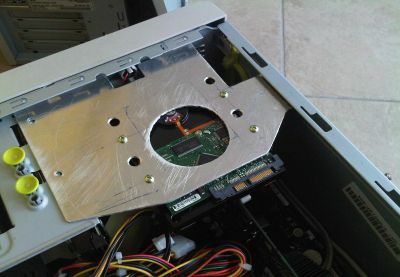 This is a server, and it doesn't need an optical drive. Or so I hope. I took out the drive bay covers and used 2k epoxy to glue a piece of perforated aluminium in their place. The top fan was was mounted using a few rubber fasteners from a Sharkoon 'silencing kit'. That kit also contained rubber feet that were softer than the original very thin Compaq ones. 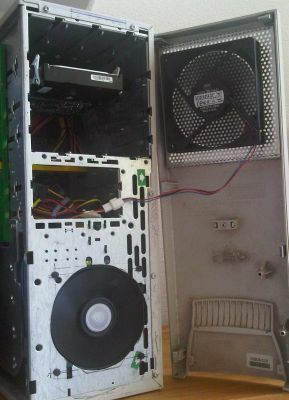 I still have to work a little on the mounting of the top fan. It's ok for now, but I can do better. 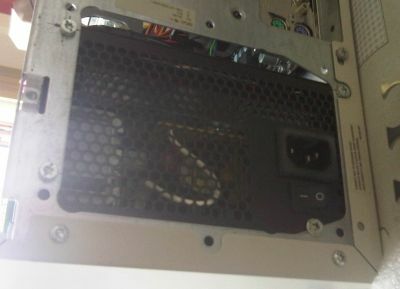 On the image above you can see how PSU mounting changed. Stil have to add a strip to close the gap between PSU and chassis. 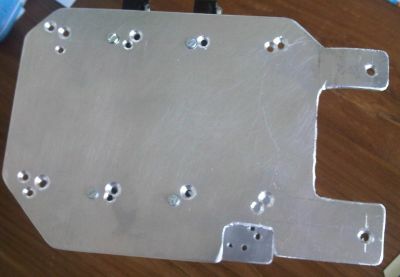 The pictures below show the hole in the chassis that I cut for the fan. 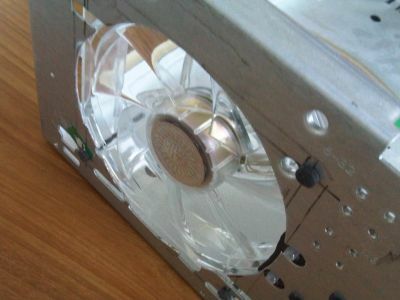 The fan is mounted using 'silicone' sound silencers (Nexus). In these pictures there's still a 4 pin Nexus fan in there, but I'm now using two old slow spinning (but silent!) Cooler Master fans, leftovers from a previous project. 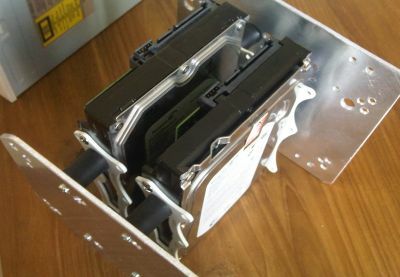 The harddrives are mounted using Nexus silencers (the black rubber pieces left and right of the drives). The silencers work well, but they're not very good quality. Expect to destroy one or two during the mounting process. Two drives sit behind the bottom fan, one drive behind the top fan. There's still place left for three more drives, for a maximum of six. The one mistake I made was picking up the wrong main board. I should have gotten a board with six sata ports, but I went cheap and took one with four. Worse, this mainboard only has a 100 mbit ethernet port. Stupid me. Perhaps some day I will have to swap it for another board so I can hook up six drives, for perhaps up to 12 TB of space... nice :-) For now, the limit is 4 drives. Those rubber Nexus HDD silencers, poor quality as they may be (and definitely not improving cooling for the drive itself) do wonders when it comes to reducing hard disk noise. You can't hear those spinners, not even when I'm seriously trashing them. Though this machine will pretty much never see serious loads in real life I still like to keep things cool yet silent. 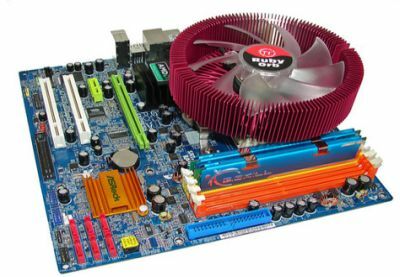 I will replace the stock cooler with a third party model once the Intel gets (too) noisy. For the moment the noise level is so low it's fine. During the peak of summer I might want to recheck those Cooler Master fans. At 20 minutes full load I managed to get the motherboard temperature up to 40 degrees, when running idle the mainboard stays at 35 degrees, probably because the passive cooler block isn't getting enough air. The Paradigit Enforcer shows a similar heat issue on its chipset. I've dubbed this machine 'Media 4'. The software configuration you'll find on the next pages. I've checked real life performance. 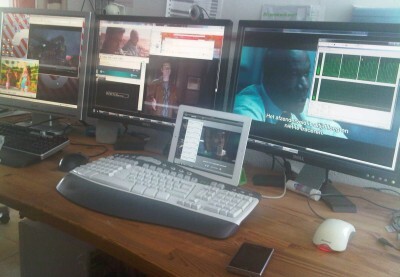 This image shows two PC's (one dual monitor) running two browsers as TVersity clients (transcoding), one XBMC as a Serviio client (transcoding), one XBMC and two VLC's playing some video files, an iPad playing a movie through StreamToMe (transcoding), and a SqueezeSlave playing music. Simultaneously, and with smooth playback (except for the browser clients that never seem to play 100% smooth). The average load on the I3 (a dual core hyperthreading chip) was perhaps 40..50%. I suspect hyperthreading may help a bit, but the grunt of transcoding would be handled by 'real' cores. Looking at those numbers even a much lighter machine such as the Paradigit Enforcer should be able to handle this, though I doubt (the user of) an Intel Atom would be happy :-). I know that in the average household it will be quite unlikely to have six people watching six different movies... The I3 is simply too powerful! I've more or less 'copied' the Retro Server configuration and run it on the older Paradigit Enforcer hardware. Those Enforcers are fine as regular PC's, but too noisy for HTPC usage and too power consuming for 24/7 operation. No luck there, and I went back to the I3. Very fast machine, can serve and transcode many streams simultaneously, starts up fast, requires a dedicated network card to get 1 GB. Bought an additional (cheap) SSD to reap max results of fast boot up time. Old server board, does support WOL but is very slow to start up, even from standby (thus no need for an SSD). The New I3 would cost approx. 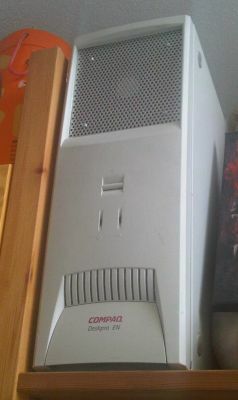 200 euro more than the the Old Xeon which came, well, pretty much free. In other words: to recover the costs of the new I3 components in use for 54 hours a week you'd have to run your this setup for 8 years. If you'd be running the server for 90 hours a week it would still take 5 years. As for energy conscious people: yes, you'd be using more energy, but do not forget that the designing, manufacuring, distributing etc. of the components would also cost resources which is often overlooked. Obviously, the ol' clunker might fail within that time frame. so things are not as simple as they seem. Conclusion: if the old hardware is capable (and reliable) enough to serve your purposes you just might consider reusing it. Check your own numbers! Obviously the same numbers game applies to NAS boxes or energy friendly Atom boards. Getting new kit might save some energy but won't always save money. More on the G3220 buid here and here and here.